Squash and racquetball bookings are included in your fitness membership. Check out our court fees. Indoor courts at the North Vancouver Tennis Centre can be booked by calling 604-983-6483. A tennis booking card is required for advanced bookings of more than 24 hours in advance. Courts booked less than 24 hours in advance are non-refundable. Outside tennis courts do not require a booking and are free for drop-in use. Block bookings and tournaments can be booked by contact our Field Bookings Office at 604-983-6318. Each player may book one court per week, up to one week in advance, and, once played, may book another. Please Note: Court time is at a premium from 3:00-9:45pm, Monday-Friday; we do not offer double bookings during these times in order to accommodate as many players as possible. A Playcard number is required to secure a court. 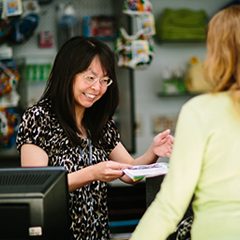 Playcards are free and available at all North Vancouver Community Recreation Centres. You can also use your Playcard to get discounts at our Playcard retail partner businesses. Players MUST check in and scan in at the front desk. All court fees must be paid before play. Please notify the front desk if you have a change in address or telephone number. Front office hours may change from season to season and during holidays. Hours are posted by the courts and on our facility pages. before 11:00am on the day of the booking or before the front desk closes the previous day for courts booked prior to 11:00am. An answering machine will pick up your message if our lines are busy. We do not accept cancellations by email. Full payment is required for late cancellations & no shows without proper notice, unless the court can be rebooked. The payment is charged to the player who booked the court and must be paid by the next court play.